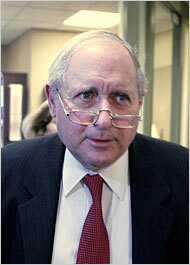 Carl Levin may be the incoming chair of the Senate Armed Services Committee, but that hardly means that he can look down at us -- or even at the Dems -- over his glasses and pronounce that we will be leaving Iraq in four to six months. Worried that the Levin-Kos-Feingold faction could dishonor all our military has accomplished in Iraq, the anti-Bush generals are lashing out at the Levinites and driving home the reality that things are not so simple in the war on terror. The NYT is giving the generals' criticism prominence, playing it three columns wide above the fold on page one, which underscores the importance the anti-Bush factions are placing on the question of what they'll do with the Iraqi firetruck they've yapped at all these years. These general's criticism of the Bush/Rumsfeld war effort was central to the Dem's midterm attack on the president and the GOP, and received an unobjective amount of press coverage. Levin will not be able to tip-toe through the tulips away from these guys, and the Dems will not be able to not not invite them to testify at any hearings on Levin's bill, given the weight they placed on the generals before Nov. 7. Welcome to your new majority, Levin & Co. I think we Republicans will enjoy the show.